All-in-One Mahjong is rated 3.7 out of 5 by 7. Rated 5 out of 5 by nancydrew33 from Fun mahjong solitaire game with nice tiles and backgrounds I liked this game, it has choice of tiles, I liked the colorful most, and a big choice of backgrounds and a good choice of layouts to play. You can play on time or just a relaxed mode to get some fun. I hope Big FIsh will publish more games like this, simple and fun. Rated 4 out of 5 by graceland9 from Gets The Job Done There are no bells or whistles for this Mah Jong game, but it's a decent solitaire game. You can choose your background, pick one of three tile sets, and work your way through the collection of tile set-ups. If you need a new Mah Jong game for the pool or beach, this one works. Give it a try! Rated 4 out of 5 by pennmom36 from It's All About Choices A Mahjong game has to be super exciting to get my attention because most of the games are boring. 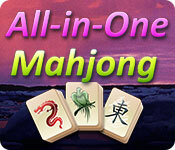 All-in-One Mahjong has some unique features that let you choose how and what you want to play. For starters, you can choose from 15 different backgrounds, not just any background, these are beautiful pictures. There are sunrise and sunset backgrounds, first snow photos, and gorgeous landscape photos from around the world, including famous National Parks such as Yosemite and Kodiak National Wildlife Refuge. After debating which stunning background to use, you move on to the Tile style which gives you three choices, a traditional type mahjong tile, a bright and vibrant color tile type or a themed mahjong tile type. Now you get to choose the mode of gameplay. You can choose to play Timed Mode which has a shuffle feature, and you must clear all of the tiles within the allotted time given. You can play Score Mode which has no timer or shuffle feature. You either win the game (think solitaire) or lose, clear all the tiles to win, get stuck with no available moves and lose. Your last choice is choosing which of the 42 Mahjong layouts to play, none are locked so you can play them in any order. The layouts are really interesting such as Butterflies, Clovers, Castles, Spiders, Cactuses, Umbrellas, Scorpions Anchors and even Space Invaders. 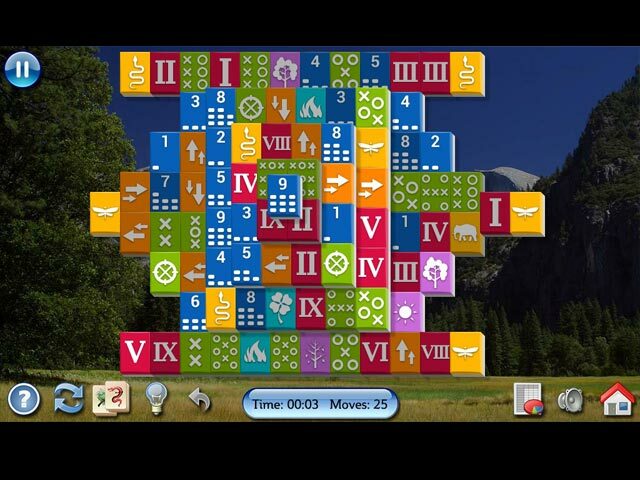 The Mahjong games themselves have the usual features, Hints, Shuffle (timed mode only) Undo, Available Moves and a Highlight feature that highlights all open available times. There are no gold tiles, at least none of the games I played had any, the object is the traditional style of just making matches of identical tiles that aren't blocked by other tiles, until all tiles have been cleared from the board. 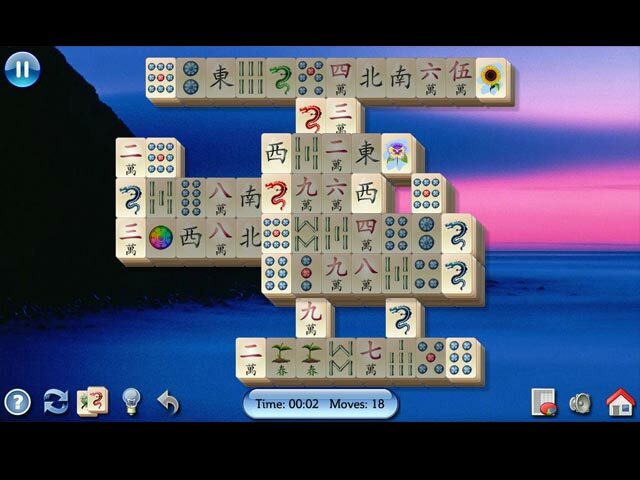 If you want to play a good old fashioned traditional Mahjong game, look no further, enjoy! Rated 4 out of 5 by sahobbs from Another version of a Mahjong Game. I've played and own many versions of Mahjong but this one a just a little bit different. Though there may only be 2 levels of Challenge, I like the "Keep Score" version. I found that this game has larger Tiles so it's easier for this ole woman to see them, but given only 3 Tile sets to choose from. The backgrounds are beautiful nature photos that don't interfere with Tiles. 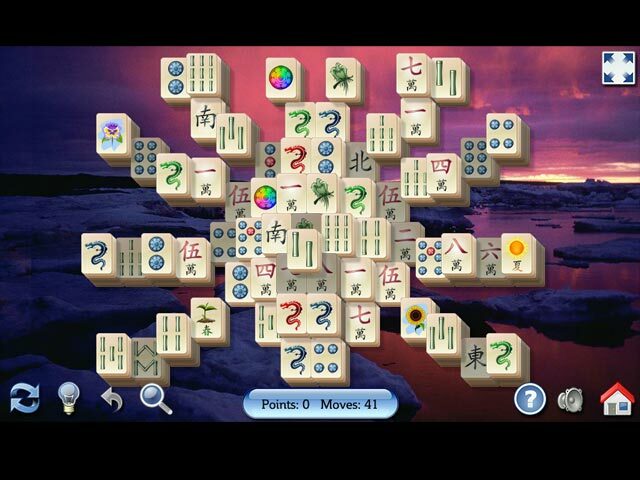 The patterns to choose from I have played in other Mahjong games but there are a few that are new to me. This is a perfect game for the Mahjong beginner, the Score version would be the best to start with then as they progress the Timed version would give them a good challenge. Rated 3 out of 5 by gizmogamers from Poor Its the same of all match 2 games of this kind. Rated 3 out of 5 by Innovativemom from Lacks the Element of Choice It was a visual treat. There were 3 sets of tiles, plenty of backgrounds, and quite a few layouts to choose from. Now, that being said, lets get down to basics. Most of the layouts, all in cutesy shapes were the type that are unbeatable. By that I don't mean that they were too challenging or difficult. They were the type that start with only a few free tiles and continue to show only a few free tiles at a time. There were three major issues that that made the game a pass for me. 1. It showed free tiles brightly and shaded the rest. I personally don't like the free tiles to be shown. It takes away too much of the challenge. At least give me the choice. 2. Before you could finish clicking your mouse, it would start with 'SHUFFLE, NO MATCHES, SHUFFLE'. There again goes part of the challenge. Give me a little time to try to figure it out for myself. 3. When you finish a game it doesn't send you to the next level. It doesn't even give you that choice. You are given two options to choose from. Your score pops up, then you can either replay the same game or delete your score and go back to the main menu. How weird is that?